Uttar Pradesh Chief Minister Aditya Nath Yogi on Saturday said his BJP government will implement Prime Minister Narendra Modis development agenda in the state and there would be no discrimination on the basis of caste, religion and gender. "It is not just a position for me, it is a very big responsibility. I will implement the Prime Minister's development agenda in the state, " Yogi said, addressing his first rally here, nearly a week after he was sworn in. He also said the government's priority will be safety of women, employment generation, end of 'goonda raj', corruption, lawlessness and anarchy in the state. "Nobody believed that BJP would come to power in UP. But, Amit Shah was always confident of winning more than 300 seats in the state. We finally won 325 seats in UP, " said Aditya Nath. The BJP leader, who was earlier called Yogi Adityanath, is now officially called Aditya Nath Yogi, as per the state government website. 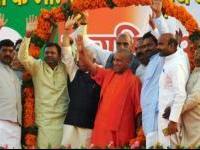 "Uttar Pradesh government will walk the path of 'Sabka Saath, Sabka Vikas'. There won't be any discrimination based on caste, religion, and gender, " he added. Aditya Nath also said: "Uttar Pradesh has been deprived until now, but it won't be neglected any more. "We have to fulfill those dreams of which UP is deprived of. It was deprived of development, women were not safe, there was no employment for youth. There was no business left for the traders, " he added. He said: "We will take up the challenges before us and fulfill the dreams of Modiji in providing development to all, to make available the benefits of government schemes to the last person. " "We will work towards development of sugar mills, to solve the problems of Anganwadi workers, farmers and to provide employment to the unemployed youth. We will fulfill the promises made through our election manifesto. We will work towards making UP the No. 1 state in the country, " he added. He also said the UP government will seek peoples' opinion on government schemes and also update them about its implementation. "We will establish law and justice in the state, " he said. Aditya Nath assured that development in the state will not be limited to just eastern Uttar Pradesh and Gorakhpur. "I will serve the 22 crore people of the state and bring an end to lawlessness and anarchy in the state. "